Luxuriously large three storey villa, air conditioned, WiFi, UK TV & movies. Furnished to a high standard, overlooking pool. Tennis & football Courts, just a few seconds walk to shops and restaurants. 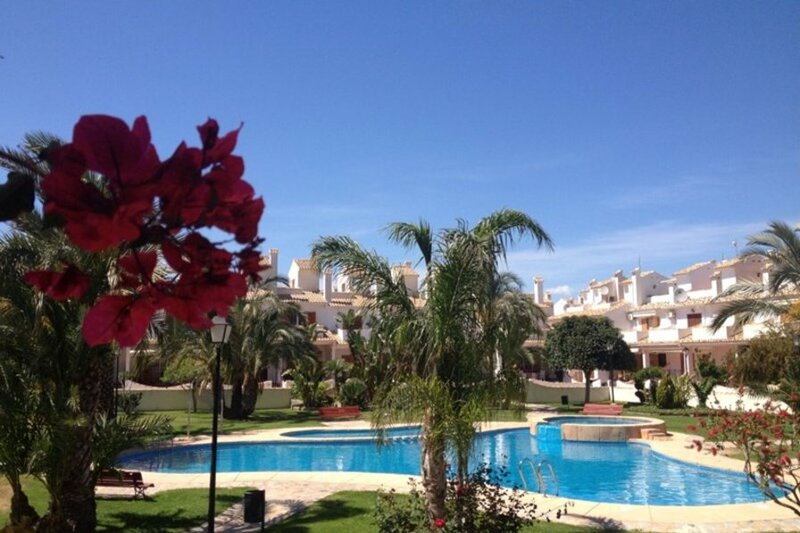 A wonderfully relaxing getaway from it all Spanish holiday - Ideal for couples & families. Costa Blanca known as the "White Coast" is a favored holiday destination by the Spanish and boasts some of the best beaches in Europe. Our home is ideally located for a relaxing getaway, less than a 10 min drive from Alicante Airport , 15 mins drive to the cosmopolitan city of Alicante and just a 10 mins drive to Santa Pola fishing village with lots more restaurants, bars, shops and beaches. Guide books, maps, local info & phrase books are available in the house for your use. Ground floor - Comfortably furnished with a three piece suite seating for six, large lounge and a working open fire place. Free WiFi, T.V., DVD, UK free-view & satellite channels & media box with unlimited films and games. Air Con/heating, patio doors leading to a partial shaded veranda with canopy, patio furniture seating six (table, chairs, parasol and sun lounges). Views over the pool, jacuzzi and garden area. Rustic style solid wooden dining table & chairs seating six. Patio doors leading to a balcony at the rear of the property. Utility room - washing machine, drying area, iron & ironing board. Bathroom: Good sized fully tiled bathroom, double sink with granite tops, w.c, bidet, full sized bath and shower. Bedroom 2: A large twin bedroom, Spanish style, furnished to a high standard, quality beds and bedding. Ceiling fan, air con/heating, full length fitted wardrobes. Patio doors leading to a balcony at the rear of the property with seating. T.V. DVD/CD with surround sound and a wide selection of films. Suitable for families, couples and excellent for long term rentals. In the basement there are two large (4ft) single sofa beds accomodating two more guests comfortably. It is a light airy room keeping cool in the hot weather. This part of the house is ideal for children / teenagers, as its used as the entertainment room - TV, Home Cinema System, DVDs, board & card games.